Seated on a semi-circle of stools, the eight dancers move slowly, robotically. Gradually their movement build as they get up, the Javanese musical duo, Senyawa, providing loud accompaniment with their handmade, electric stringed instruments. The dancers’ trance-like state renders their movement as pure dance, the artists channeling their own interpretation and allowing the movement to flow through them, free from artifice and extrinsic influences and without any concern for connecting with the audience in a traditional sense. Senyawa’s (Rully Shabara & Wukir Suryadi) impressive booming vocals build along with their pulsing, driving rhythms that grow in intensity alongside the movements. The music is a little bit tribal, a little bit operatic, a little bit heavy metal, and 100% impressive. Paired with the dancers’ relentless fervour of movement, there is a sense that the work is generating its own energy, picking up steam as it goes along. Just as things are coming to a head, random audience members calmly join the dancers on stage, looking as if they know exactly what to do and fitting themselves into the choreography. It turns out the 20 volunteers who are chosen pre-show are fitted with an earpiece so they can hear instructions. The effect is smooth as they join in the trance and become an integral part of the show. 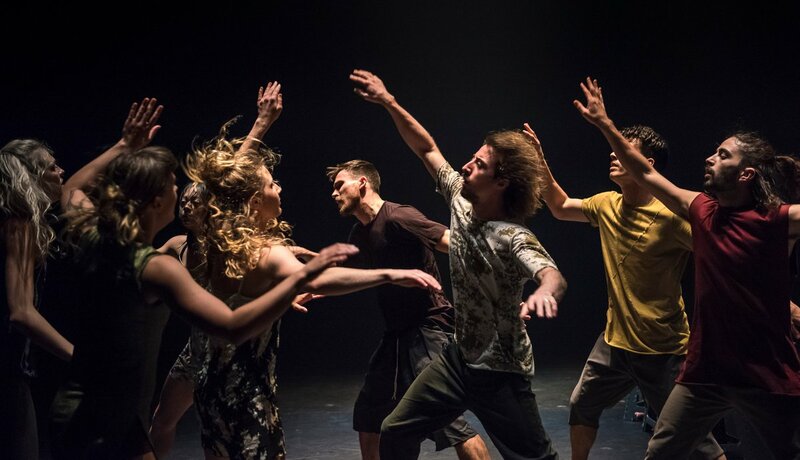 Attractor is impressive for so many reasons, but ultimately it’s a piece that demonstrates the most powerful aspects of dance: building community and losing yourself in the movement. Seated on all sides of the oval-shaped performance space, the audience had many views of this repetitive, looping work that explores concepts of time, evolving movement phrases, and collaboration. Company 605 artistic directors Lisa Gelley and Josh Martin sat at two soundboards as the five performers slowly built on their movement phrases, working together and saying things like “here?” or “like this?” to signal to each other and create evolving movement phrases in a collaborative nature. The concept is interesting, but I found the execution to be a bit too repetitive and I thought the dancers’ voices were quite soft as it was sometimes difficult to understand what they were saying to each other. The piece has evolved since it was shown at the 2018 Dancing on the Edge Festival, but it retains its casual, rehearsal room feel and simple t-shirt and jeans look. Although there were moments when the performance dragged, the overall concept and the way it was explored provided a lot to think about as the dancers repeated loop after loop of the same sequence. The architecture of the Anvil Centre was the most prominent character in this impressive, innovative, and surreal site-specific work that takes audiences up and down stairs, into bare classrooms and a darkened theatre, and on an exploratory journey full of surprises. Using the many windows and skylights of the Anvil Centre, choreographers Delia Brett and Daelik have created dancing shadows and reflections that add to the surreal, dream-like quality of this work. During each performance, two small groups of audience members are led through various scenes and locations in the building. We began by walking up an angular staircase as the dancers walked down the stairs – backwards and with their eyes closed. From there, we moved to a room that was perfect for playing with shadows and reflections, with windows to the hallway on one side and two sets of windows on the opposite side of the room, one leading to the inside of the building and in front of that the windows forming the outside wall of the building. Playing with the blinds to frame the action in creative ways, the dancers moved behind us, dancing outside the hallway windows as we watched their reflections. Some audience members chose to turn around in their seat and watch the dancers themselves, while others watched the dancing reflections. From the landing above the atrium, we watched shadows dance on a slanted marble wall, reflections on a high skylight above, and the dancers themselves on two levels below us. There were a multitude of perspectives to choose from as we watched the dancers and their shadow figures. In the theatre, we sat in darkness as the dancers moved as tall figures cloaked in black. The lack of light make things look very different than they did when the lights came on and we walked out to another landing, watching the dancers below in the large glass walls of the building. One of the most striking scenes involved a huge long strip of red fabric pulled down the stairs, emphasizing the lines of the architecture and the dancers’ movement in relation to them. Back down in the atrium, the dancers created an intricate pattern with ropes wrapped around the large concrete pillars. Slowly they walked over and under the strands to unravel their creation and unmake the performance space that they inhabited and to which they gave new meaning.